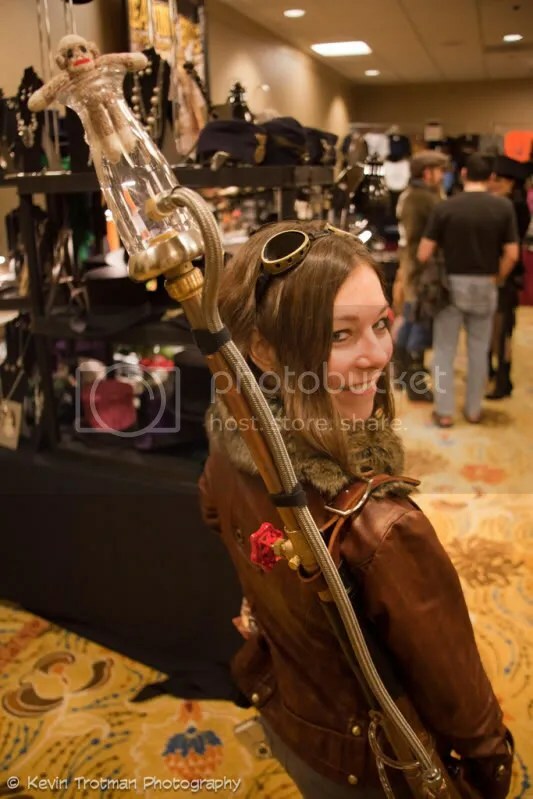 AnachroCon, held in Atlanta, GA in February, is quickly carving out a niche for itself among the slew of other Steampunk conventions that have popped up around the country in the last couple of years. 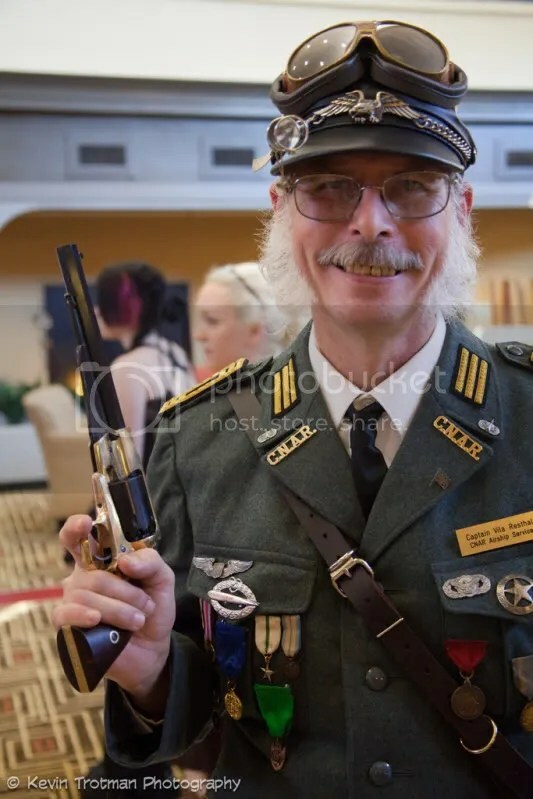 The most obvious difference is that AnachroCon isn’t strictly a Steampunk con, but is instead about the larger genre of Alternate History, which can include all manners of historical-based categories like Steampunk and Dieselpunk as well as straight-up historical costuming and reenactment. When walking around the con, you’re just as likely to see giant Steampunk contraptions as you are soldiers from the Revolutionary War. Photo courtesy of Kevin Trotman. Click for more info. But that isn’t the only difference that sets AnachroCon apart from the others. The convention is run by William and Cindy MacLeod, the same team who runs the increasingly popular Alternate History track at Dragon*Con and who have pushed it in a more scholarly direction. In addition to the regular media guests like bands, makers, writers, etc., AnachroCon has dedicated programming tracks to both science and history, allowing them to bring in guests who are experts in their fields to teach the attendees about their areas of research. Another particularly exciting addition was several living historians, people who have extensively studied a specific historical figure and then dress up as them in order to show modern audiences what that person would have been like. Of course, the special thing about AnachroCon that specifically relates to me is the Culture Track. My job, as the Cultural Track Director, is to create programming that doesn’t necessarily teach people things like the history or science tracks do, but to get them to think for themselves. For example, the most popular panel on my track has been about Gender and Race in the Alternate History fandom, though at AnachroCon this year I also ran such panels as “Alternate History vs. Revisionist History” and “Steampunk and Elitism”. While other conventions may dedicate a few panels to that sort of academic pursuit, AnachroCon has assigned an entire track to it, for which I am most grateful. Don’t let the sheen of respectability fool you, though. Amidst serious scholarly discussion is one giant party that runs all day long, aided by a centrally-located bar as well as almost constant musical accompaniment by bands such as Atlanta’s own The Extraordinary Contraptions, along with many others. The multi-band jam sessions in the concourse were absolutely delightful, and were something that I expect to see replicated at other conventions in the future. Multiculturally, AnachroCon was nothing special this year, though I hope that we see more people engaging in multicultural costuming in the future. 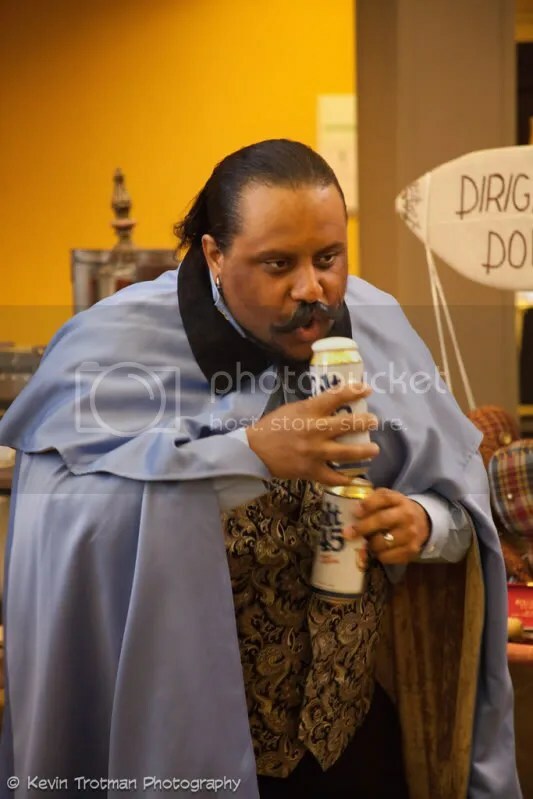 There were a few notable exceptions like Mark Curtis, who did a number of excellent costumes such as Steampunk Lando Calrissian, complete with cans of Colt 45. Lando takes a break with a couple of Colt 45s. Image courtesy of Kevin Trotman. Click for more info. Personally speaking, I was impressed with how smoothly the con went. As one of the directors, I was privy to all of the behind-the-scenes terror that haunts every convention, and the problems that we had this year were remarkably few, given how much of a transitional year this was for us. In addition to changing hotels, we also changed pretty much the entire administrative structure of the convention, but despite all of that, the con went more smoothly than other, more well-established conventions that I’ve attended, and no one was more surprised than myself. What really made AnachroCon great, though, was something that I’ve also found at a number of other Steampunk conventions that I’ve attended, and that’s the people. Whether it’s TeslaCon in Wisconsin where I knew almost no one or AnachroCon in Georgia where I knew almost everyone, I consistently find the attendees far more friendly, engaging and polite than at almost any other cons I’ve been to. I can largely attribute that to the average age of attendees, which for Steampunk and Alternate History is far, far higher than say, your normal anime con. But even beyond that, there may (or may not) be a link between those interested in history and those who treat others with respect. After all, when someone studies history, they become aware of their place in the larger scheme of things, an awareness that can’t help but be humbling. Long story short? Come out to a Steampunk or Alternate History convention. Whether it’s AnachroCon or not doesn’t matter, so long as you get out there and participate in the community. Though of course I recommend AnachroCon! Sock puppet launcher. Image courtesy of Kevin Trotman. Click for more info. Austin Sirkin is a graduate student at Georgia State University studying 19th Century Science Fiction. 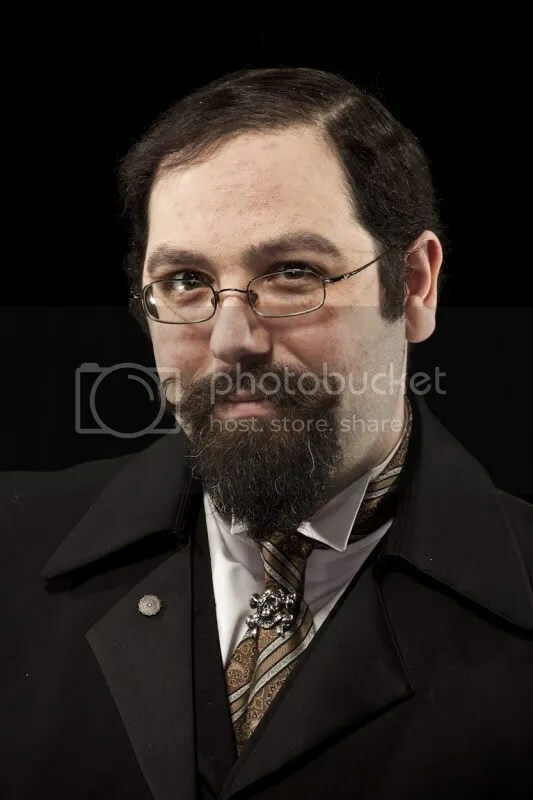 He uses his critical background to also study steampunk and speaks about it at conventions and conferences around the country. Kevin Trotman is a photographer based in Atlanta, Georgia. One thing that You didn’t touch on, Austin – and it bears repeating, so I will. The hotel staff, far from being overwhelmed by AnachroCon’s 700 attendees, plus the other group that was holding meetings in one ballroom, plus regular hotel guests who just happened to be there on the same weekend… No, the hotel staff bent over backwards to insure everyone’s stay was as pleasant as they could make it be. When the elevator jammed, it took only moments for the hotel staff to get it running again. Problems with various rooms were solved just as quickly. On a personal note, I casually mentioned to the waiter of the hotel restaurant that I was on a salt-free diet because of blood pressure problems, *after* my wife and I had ordered our meals and we were just nattering on with the waiter as the cook prepared our food. I thought nothing of it, until my meal was delivered. No salt on anything on my plate! The food was excellent, with other spices added as they were needed, but even without asking, I was given exactly what I needed. These are just a few examples of how hard th hotel staff were working that weekend. Kudos to them!